This guide is available to download as a free PDF. 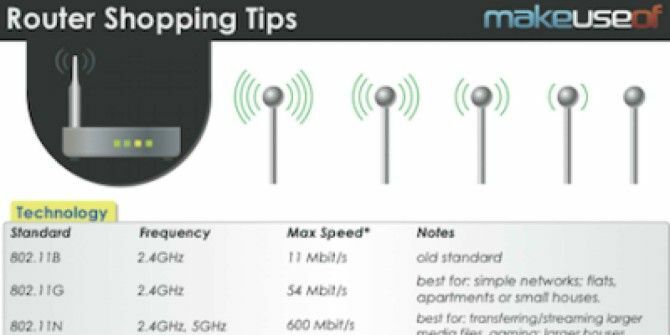 Download Router Shopping Tips & Tricks now. Feel free to copy and share this with your friends and family. Shopping for a router can be incredibly difficult. There are so many different brands, price ranges, and types of technology out there, it can be overwhelming. Next time you need to go to the store, bring our handy cheat sheet with you, and you will be ready to pick out the perfect router for your needs, without all the confustion! 802.11G 2.4GHz 54 Mbit/s best for: simple networks; flats, apartments or small houses. *The speed indicated on vendors’ packaging is the one tested under “the best circumstances” (clean area, no interference). Security tip: even though most of modern routers support WPA2, just make sure it does. Explore more about: Cheat Sheet, Router.